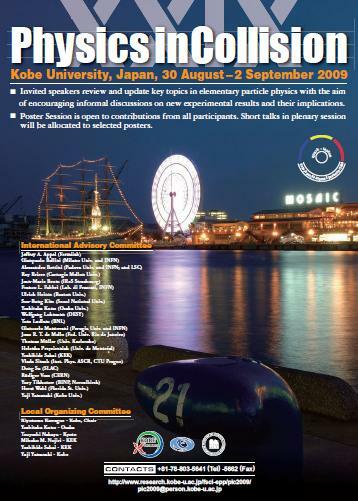 From August 30th to September 2nd I will attend the 29th edition of "Physics in Collision" in Kobe, Japan, to hear a few interesting talks and to present a poster on behalf of CMS, about the search for the Standard Model Higgs boson. Posters are what they sound like -big, illustrated sheets of paper. Many conferences have a "poster session" in which authors of the posters stand in front of their creation and discuss the details with colleagues and answer questions about the contents. Before the poster session, each poster is usually presented by the author with a short oral memo -five minutes each at PIC. I am not too enthusiastic about flying ten thousand miles around the world for a poster -this is a thing typically used to allow young PhD students or post-docs to participate in conferences only featuring plenary talks; and I am by now used to be giving the talks... But I guess I cannot complain: first of all, it is the first time I will represent CMS at a conference, and second, I have never been to Japan before. Actually, I am thinking about using the occasion for a longer trip, but since my family will not be able to join me, I hesitate planning anything but a flight in, four busy conference days, and a flight back. I know little about Japan, so if you have suggestions on what I should do or see while I am there, please let me know!